FSU: Smith 9-72, Floyd 5-44, T. Holloman 1-2, Ross 3-minus-1, Williams 5-(-2), Ferguson 8-(-39). NEB: Taylor 22-139, Keith Jones 17-58, Kelley 9-35, Kaelin 5-32, Heibel 6-20, Sheppard 2-14, Blakeman 1-1, Brinson 1-minus-2. FSU: Herb Gainer 2-23, Paul Carter 2-13, Floyd 1-30, D. Holloman 1-13, Williams 1-11, White 1-9, Ross 1-minus-2. NEB: Sheppard 2-54, Willie Griffin 2-21, Dana Brinson 2-11, Gamble 1-13, Schnitlzer 1-13, Millikan 1-12, Kelley 1-6. Missed field goals: Nebraska, Klein 49. 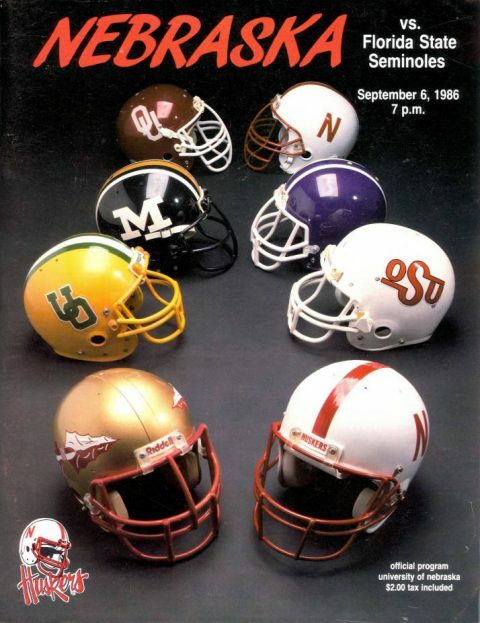 In the first Memorial Stadium night game, quarterback Steve Taylor rushed for 139 yards and two touchdowns and threw for two more scores as No. 8 Nebraska defeated No. 11 Florida State, 34-17. Early on, it looked as if FSU would match its 17-13 upset of Nebraska from the previous season. The Seminoles sprinted down the field in the game’s first drive, covering 74 yards in six plays. Chip Ferguson hit Victor Floyd for a 30-yard TD to cap the drive. Nebraska answered early in the second quarter as Taylor scrambled 34 yards to put the Huskers on the FSU 20. He then sprinted around left end on the next play for the game-tying touchdown with 9:11 to go in the half. Dale Klein’s 33-yard field goal gave the Huskers a 10-7 lead with 57 seconds left in the second quarter. It looked as if NU would take a lead into the locker room until Sammie Smith dashed around left end for 57 yards on a fake reverse for a TD that gave the Seminoles a 14-10 halftime lead. Things got worse for Nebraska early in the third quarter. After the Huskers went three-and-out on their first drive and the Seminoles’ offense did the same, Dana Brinson fumbled on the ensuing punt return, and the Noles recovered at the NU 35. FSU picked up nine yards on the first three plays and looked to have converted the 4th-and-1 at the Nebraska 26, but an illegal procedure call erased the conversion. The Noles settled for a field goal that gave them a 17-10 lead five minutes into the third quarter. The next two Husker drives were aided by pass interference penalties. On the first drive, NU marched from its own 37 to the FSU 19. On 3rd-and-8, a pass from Taylor to Rod Smith was incomplete, but an interference call kept the drive alive. On the next play, Taylor scored his second touchdown of the day with a six-yard keeper. After FSU was three-and-out on its next drive, NU again benefited from an interference call on 2nd-and-10 from the FSU 22. On the next play, Taylor hooked up with Todd Millikan for a 12-yard touchdown pass to give the Huskers the lead for good. Nebraska tacked on a 46-yard touchdown pass from Taylor to Von Sheppard and a 38-yard Klein field goal to finish off the 34-17 win. The Husker defense held the visitors to minus-two yards after halftime as Nebraska outscored the Seminoles, 24-3, in the final 30 minutes.